← Slayer vs. Player. Who wins? Why would anyone be “pulling it” during a fight in the water? Eh? Eh? You know what I mean. @Myro: That’s why he said that it was a bad time to be pulling it. There’s a “pulling it in your sock” joke here somewhere, but I haven’t figured it out yet….. 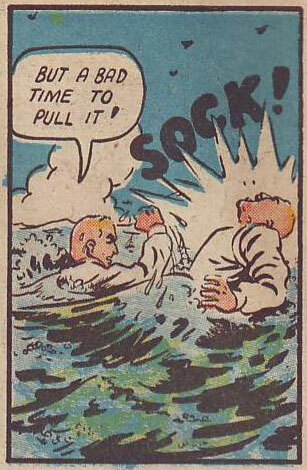 It was a bad time to be pulling it because he hadn’t been given the sock yet. In my experience there is NEVER a bad time to pull it. Quick grab onto something so we wont drown, not that you dope, thats the last time I hang out with a navy guy!